A strong second half performance saw Corofin/Ruan overcome the challenge of a gallant Tulla side in the U-14 B Final, played in Clarecastle on Friday, June 7th. Tulla got off to a great start and led 3-1 to 0-0 after 10 minutes. Two well taken Ashley Brohan goals reduced the deficit and Corofin/Ruan only trailed by 5 points at half-time, 3-5 to 2-3. Tulla scored a fourth goal early in the second half they looked to be on the road to victory. Corofin/Ruan improved their performance throughout the field and goals from Colin Haugh (2), Gearóid Cahill, Seán O'Brien and Kevin Keane put Corofin/Ruan into the lead. Tulla were awarded a penalty but they failed to convert this and that ended their chances of coming back into contention in this final. Corofin/Ruan ran out deserving winners on a final score 7-7 to 5-5. Amid great scenes of celebration, joint-captains Gearóid Cahill and Colin Haugh accepted the cup from Bord na nÓg Iomáint Chairman Martin Reynolds for the second year in a row. Corofin/Ruan Team:- Josh Ryan, Conor Wynne, Eoin McMahon, Liam McGrath, Seán Danagher, Tola Neylon, Eoin Leane, Seán O'Brien 1-0, . Gearóid Cahill 0-3 (0-2 frees),. Caimin Whelan, Ashley Brohan 2-0, Ryan Fitzpatrick, Kevin Keane 1-0, Colin Haugh 3-4 (0-3 frees), Eoin Burke. 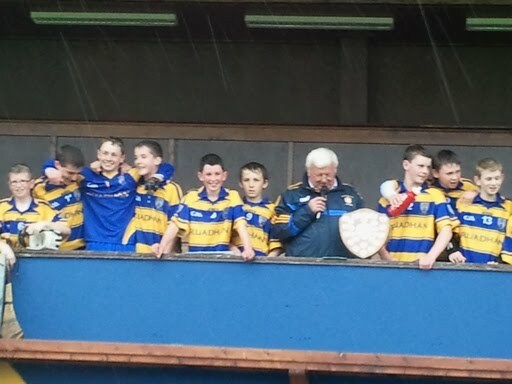 Ruan captured the U-14D title at a wet Cusack Park on Saturday but they were made fight all the way by gallant Ennistymon who will be wondering what the outcome might have been had they converted all of their chances, especially in the second half. Ennistymon were first to score when their midfielder and captain Dirring McNamara pointed a 35m free. However this was to be their only score in the first period as Ruan dominated with Colin Haugh in great form. Haugh was to score 1-4 (1-3f) of Ruan’s 1-5 in this period, his goal from a free after the Ennistymon goalie Joe Kivlehan was deemed to have picked the ball from the ground in the tenth minute. Eoin McMahon was the other Ruan payer to score with an excellent long range free. Ennistymon resumed in the second period with Aaron O’Brien in goal. When he was slow to clear his line Ruan corner-forward Alan McDonald pounced to score his sides second goal. Incredibly this was to be Ruan’s last score as Ennistymon dominated with Dirring Mc Mamara and Luke Howley ruling the roost at midfield. In the 12th minute Ennistymon’s Derek McInerney had a great goal chance but his shot went narrowly wide. Ennistymon substitute Patrick O’Rourke had an excellent point on 15 minutes from the 45m mark. Ennistymon were now in all-out attack mode and were rewarded with a great run by Brian Considine who passed to captain McNamara who finished to the net. It was game on now with Ruan defending for their lives and David Hehir and Ross O’Donovan clearing time and time again. Ruan’s best player Haugh was now back to help out his defence. The second goal Ennistymon needed never came and they had to settle for a late point from Patrick Kelly. Ruan: Jack Hehir; David Hehir, Eoin McMahon; Conor Wynne (0-1), Ross O’Donovan, Nathal Bluett, Ryan Fitzpatrick; Brian O’Sullivan, David Kirwan, Colin Haugh (1-4), Alan McDonald (1-0). Ennistymon: Joe Kivlehan; Cathal O’Gorman, Padraig Kelly (0-1), Jack Crosse, David McNamara, Luke Howley, Dirring McNamara (1-1), Cillian O’Donoghue, Brian Considine, Aaron O’Brien, Derek McInerney. Subs: Patrick O’Rourke (0-1), Dara McInerney, Niall Canavan. IN a very entertaining U-14B Hurling Championship final at Cusack Park on Saturday, Corofin-Ruan captured the honours when the accounted for the holders, Ballyea. The final scoreline says the margin was four points but the sides were much more closely matched with the result in doubt right to the final whistle. The game was in the second minute of injury time when Conor O’Loughlin’s delivery from midfield went all the way to the net to finally seal victory for the new amalgamation, which only came into being this season. They took the lead in the very first minute with a point from wing-back Tony Neylon but 14 minutes went by before they had their next score, a goal from joint captain Mark Corry, whose effort from 45m went all the way to the net. At this stage, a comfortable win for Corofin-Ruan looked likely as they had opened a 1-1 to 0-0 lead despite playing against the wind. The game was 19 minutes old before Ballyea finally opened their account through Conor Lynch. From here to the half-time whistle, they were in control and picked off some great scores in the process. Two further Lynch efforts from frees and a Sean Meaney point had them on level terms (1-10 to 0-4) with five minutes still remaining in the half. Following a great save by the winners’ goalie Gearóid Cahill from Dean Minogue, Ballyea took the lead when Lynch converted the resultant 65’. Minogue then struck for a goal before Lynch converted another long-range free and Ballyea went to the break 1-6 to 1-1 in front. Having to face the wind in the second half, one of the talking points at the interval was whether or not Ballyea’s five-point lead would be sufficient. A Mark Corry point and a goal from Colin Haugh saw the winners cut the lead to the minimum within five minutes of the resumption. Things didn’t look good for Ballyea but a Conor Lynch free gave them hope as the standard of play improved. Two superb scores from midfielder Conor O’Loughlin helped the winners move a point clear by the mid-point of the second half but two equally impressive scores from Dean Minogue had Ballyea back on level terms with 10 minutes remaining. Minogue was unlucky to see his flick on a high delivery go narrowly wide with seven minutes remaining and as both sides fought tooth and nail for the upperhand a draw was looking increasingly likely. Mark Corry converted a 30m free for the Corofin-Ruan combination four minutes from the end before O’Loughlin’s injury-time goal sealed victory. Gearóid Cahill, Cathal Corbett, Ross O’Donovan, Conor O’Loughlin, Mark Corry and Colin Haugh impressed for the winners. Ballyea’s best were Mark and Liam Crowe, Dean Minogue Sean Meaney and Conor Lynch. After the game, Bord na nÓg chairman Martin Reynolds presented the cup to the joint captains of the winning team, Conor O’Loughlin and Mark Corry. Corofin-Ruan: Gearóid Cahill; Conor Wynne, Cathal Corbett, Eoin McMahon; Liam McGrath, Ross O’Donovan, Tola Neylon (0-1); Conor O’Loughlin (1-2), Damian O’Loughlin; David Hehir, Rory Conroy, Mark Corry (1-3); Nathan Bluett (0-1), James Tierney, Colin Haugh (1-1). Sub: Cillian Clancy for Hehir (half-time). Ballyea: Oisín Hennessy; Conor Donnellan, Peter Casey, Robert Mannion; Greg Allard, Mark Crowe, Liam Crowe; Dean Minogue (1-2), Eamonn Breen; Aaron Griffin, Sean Meaney (0-1), Conor Lynch (0-6); Aidan Lynch, Daniel Cleary (0-1), Michael McCarthy.